MEMBERSHIP: GROWTH is the GOAL! Peach State CLC is growing in vibrancy and BUZZ, and as a result it’s growing in SIZE. 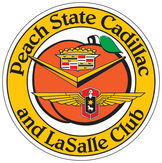 Seldom does a week go by without us receiving an invitation to some concours or gathering of old car aficionados – and it’s because those who are promoting these car events have learned Peach State CLC is a club that shows up in numbers. For several years, we have had our best year ever for club growth. And that’s worth a good old Town-and-Country horn-tooting!!! Between ’88 and 2000 the club added an average of 1.5 members per year. But 2001 was a relative rip-snorter! One day we will hear from our founders how they jumped on 10 new members that single year. Then, from ’02 through 2007, the year of the Grand National in Savannah, Peach State added only an average of 3 new members a year. A membership lesson learned: The classic car hobby is withering on the vine in lots of places. It’s inevitable. By the time we are old enough to afford these adult toys, most of us have fewer years left here on Mother Earth to enjoy them. Peach State gets no pass on this phenomenon. We watched as we lost a sizeable number of longtime, dedicated members to death and infirmity in 2008. We expect to lose six to eight every year. If a club loses eight a year to Father Time or to the urge some have to move onto other passions, it had better sign up eight or more a year just to tread water. If Peach State had not added 131 new members over the past eight years (an average of 16 per year), our club roster would be in tatters. Instead we number well over 100 ACTIVE members. So, what does a club do to draw in “fresh blood?” Easy question to answer it turns out: Be the best danged car club around! Give people the activities they joined to do! Keep members informed and involved, stay open to new ideas, and NEVER FORGET TO REMAIN CENTERED ON CADILLACS! Do things everyone enjoys, but never forget to include the cars. We now have almost 200 Cadillacs in the club and nine or ten LaSalles. Now, that’s passion about these pieces of Americana. They are rolling artwork, yes. But they’re also a rolling testament to the technologies of our past, to our society’s glory years of productivity, and to Americans’ yearning for the road. We have to tap those themes if we want to keep our members. If we can also find people willing to give of themselves, like our Founders did, we should be able to sign them to “long term contracts” in service to the club. If we can accomplish that we will have cause to celebrate, because we will continue to be a vibrant and active club. DON'T MISS OUT ON ALL THE EXCITING EVENTS THIS YEAR - JOIN THE FUN!